Vancouver: The Victoria Drive assembly purposes in the will of the Lord to have gospel meetings commencing February 19 with Leslie Craig (N. Ireland) and Jon Procopio (NB). Please pray that the Lord will use this effort to reach souls in this city. 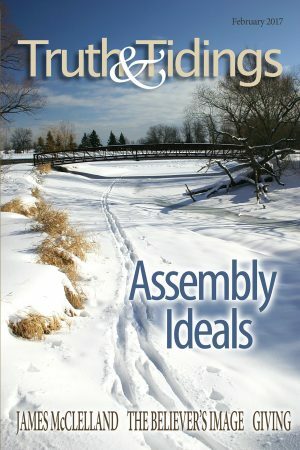 West Kelowna: The assembly at Highway Gospel Hall purposes to convene gospel meetings with David McKillan (N. Ireland) in mid-February. Please pray for these meetings. Brandon: The assembly held a week of children’s meetings in November with Mike Knox of Austin. Mike ministered on the attributes of God under the title, “Things God Can’t Do.” Attendance was encouraging with a number of children and parents present each night. Rigaud: Believers from the Pincourt (Montreal) and Ottawa assemblies “held up the hands” of Larry Buote as he preached for eight nights in September. The attendance was encouraging. Ste. Flavie: The small assembly has been encouraged when a mother and her daughter were baptized in August. Prayer for the Lord’s work in Quebec is appreciated. Alpena: The assembly enjoyed helpful ministry from Joel Portman in December. Springdale: Towards the end of 2016, two young men were baptized and one was received into assembly fellowship. Phoenix: The Phoenix Thanksgiving weekend conference was an encouragement to all who attended. The subjects of “The Rapture” and “The Return of the Lord to Reign” were enjoyed by all. Bill Lavery and Stan Wells had a few meetings following the conference. Dewar: Gospel meetings at the Dewar Community Hall were held on January 15-20. Russ Nesbit and Dennis Stickfort conducted the meetings. Please pray for this effort. Stout: William Skates visited the assembly in January for a Lord’s Day and five nights with appreciated ministry on titles of the Lord Jesus Christ. Rochester: Continue to pray for the gospel outreach here most Friday nights. If any have contacts, saved or unsaved, in Rochester, please contact Jeff Scherer at jscherer17@yahoo.com, or Cal Erickson at cberickso@hotmail.com. Salem: Gospel meetings began on January 8 with Jerry Jennings. A number of teenagers are persons of interest. Please pray that God will bless in salvation. Blue River: The first of the winter Bible readings was held on January 22 on 2 Thessalonians 2. On February 26, 2 Thessalonians 3 will be taken up in Black Earth, and on March 12, “Introduction to the Days of Scripture” will be the subject in La Crosse. La Crosse: The assembly held children’s meetings Sunday, January 8 through Thursday, January 12, with Dan Shutt. On Sunday, a community outreach supper was followed by the Bible lesson. Monterrey: Abisai and Carmen Vieyra moved from Iguala, Guerrero early in December to help Anderson and Mariu Hernández in the work here. Close to 100 believers from Mexico, Canada, and the United States arrived for the last week of December to deliver 110,000 Seed Sower texts and invitations. Gospel meetings commenced on December 26. Hermosillo: The last children’s meeting in Laura Alicia Frías was held on December 10 when around 70 children heard a message from the Word of God. Please pray for the children’s work here, as well as the weekly gospel meeting held outside the home of believers on Wednesday evenings. Irapuato: The believers enjoyed five nights of ministry from Paul Thiessen early in December. La Purísima: On December 10, the believers were happy to see the roof poured on the hall that is under construction. Pray for the furtherance of the gospel in this small area. Puerto Vallarta: The annual conference in El Coapinole was held from December 9-11 with brethren visiting from different parts of the Republic as well as from Guatemala. Paul Thiessen, Gilberto Torrens, Harrys Rodríguez, Leonel Chávez, Timothy Woodford, Jonathan Seed, Andrew Zuidema (Midland Park, NJ), David Seed (Vancouver, BC), and Oscar Ochoa (Zona Siete, Guatemala) all shared profitable ministry from the Word of God. A young man was baptized after the Saturday gospel meeting. Veracruz: Two new families have recently begun attending meetings at the hall, showing interest in the teaching. Work on the construction of the new hall continues to progress. Cancún: The arrival of believers from Mexico, Canada, and the United States to deliver 60,000 Seed Sower texts was a tremendous blessing and help in the work here. Gospel meetings commenced on December 25 with Timothy Turkington and Timothy Stevenson. Shad Kember joined Timothy Turkington early in January. The attendance at the Sunday school continues to be very encouraging. Late in December at the Sunday school closing, a number of parents were present to hear their children quote Bible verses. Nueva Jerusalem: The gospel hall-sponsored university studies program has now completed its first year. UMAJA (University Meso-American Jerusalem of the Assemblies), which is fully accredited, is located in this town in the municipality of Las Margaritas in the middle of indigenous Mayan populations, most of whom still speak their dialects in addition to Spanish. The assembly has been instrumental in working with the local Mayan tribal leaders. Courses offered are in computer systems, tourism, and social service. There are about 10 assemblies in the indigenous sector of the state of Chiapas, approximately 25 in the entire state, and many more assemblies across the border in Guatemala, which can have their educational needs served in a Christ-centered environment. Construction on a permanent five-acre location is planned for August 2017, DV. Tuxtla Gutiérrez: A new assembly in the capitol of Chiapas is now one year old. There are 15 in fellowship. The majority in the assembly are indigenous brethren who speak the Zoque dialect. Meetings are held in Spanish. Armagh: S. Gilfillan and D. Straghan plan to commence on January 15 in the gospel hall. Belfast: The Assembly Buildings Conference Centre was rented for the annual conference on December 28. W. Martin and P. Coulson were responsible to open and lead the Bible readings on 1 John 1 & 2. These were helpful Bible readings and good ministry was given in the evening. Dromore: T. W. Wright and A. Nesbitt hope to join in a gospel effort in the gospel hall on January 22. Newry: The assembly expects to have meetings in the gospel hall with J. Rogers and J. Fleck commencing January 15, DV. Limavady: J. Hay and D. Gilli­land expect to commence gospel meetings in the town hall on January 22. Fintona: U. Ussher (Venezuela) and S. Nelson joined for gospel meetings in the gospel hall in mid-January. Newtownstewart: At their year-end conference in a local school on December 31, D. Gilliland ably opened and led the Bible reading on Hebrews 10, with active participation from others. Four brethren gave helpful and encouraging ministry in the afternoon session. During the Christmas and New Year holiday, quite a number of conference meetings were convened such as in Buckna (Co Antrim) and Kilkeel (Co Down) when helpful and challenging ministry was given to the Lord’s people. Year-end ministry meetings on December 31 were convened at Lurgan (Co Armagh), Sandringham, Bangor (Co Down), Fortwilliam (Belfast), Holywood (Co Down) and Cambridge Ave. (Co Antrim). These meetings have proven to be encouraging and edifying over the years for young and old. February 10-12, in the San Diego Gospel Hall. Friday: Prayer Meeting, 7pm. Saturday: Bible Study 10am (Headship), Lunch 12pm, Ministry 2pm, Dinner 5pm, Gospel 7pm. Sunday: Breaking of Bread, 10am, Lunch 12pm, Open Sunday school 1pm, Ministry 2pm, Dinner 5pm, Gospel: 7pm. Speakers expected: Tom Baker, Shad Kember Jr., David Richards, Paul Thiessen, and Stan Wells. Contact: Ken Baker, E-mail: kenbakersd@gmail.com. March 4-5, in the Matoaca Elementary School (2 blocks past the gospel hall), with Prayer meeting on Friday, March 3 in the gospel hall, 6204 River Road, Matoaca, VA. First meeting on Saturday is at 10:30am. Contact: John Nobles, Tel: 804 265-5455, or E-mail: jnobles6@verizon.net. March 25-26, Bible Reading conference, with Prayer meeting on Friday at 7:30 p.m. at the Gospel Hall. All other meetings will be at the North Crawford High School north of Gays Mills. First meeting on Saturday is at 10am. Breaking of Bread on Lord’s Day at 9:30 a.m. Bible Reading topics will be on “The New Testament Assembly: the Formation, Fundamentals, Fellowship, and Fostering.” Accom: Richard M. Dudgeon, Tel: 608 734-3639, E-mail: rmdudgeon@juno.com; or Wayne Granzow, Tel: 608 874-4760, E-mail: wcgranzow@centurytel.net. Outlines of the readings and order of meetings will be sent on request. April 8-9, commencing with Prayer meeting on Friday, April 7 at 7:30pm. Ministry begins on Saturday at 10am. Lord’s Day: Bible Reading 9am (Psalm 23), Breaking of Bread 10am. All meetings held in the gospel hall. Corr. Gary De Groote, 28073 WestBrook St., New Hartford, IA 50660; Tel: 319 983-2713; Cell: 319 231-4132; E-mail: gdegroote2@msn.com; Hall: 319 346-1153. April 14-16, Easter Conference. Friday: Prayer/Ministry 7:30pm in the gospel hall, 154 Mill Street. The following meetings are in the Kapuskasing & District High School, 61 Devonshire Street. Saturday: Prayer/Ministry 10am, 2pm & 7pm. Sunday: Breaking of Bread 10:30am, Ministry 2pm, Gospel 7pm. Accom: Gerald Labelle, Tel: 705 335-3712, E-mail: gllabelle1@gmail.com. John and Linda Fitzpatrick, 7000 North 16th St., Ste. 120, PMB 380, Phoenix, AZ 85020. Cell (USA only): 206 979-2544; E-mail: johnfitz2011@gmail.com. Mrs. James (Margaret) Smith, 3605 Sweetgum Dr., Jackson, MI 49201. Thomas Craig Mowry of Janesville, WI, on September 28, 2016, age 78, surrounded by loving family. Our dear brother was saved at age 24 while working on the assembly line for GM, realizing for the first time that salvation was a gift, pure and simple. Our beloved brother will be missed for his abundant faithfulness and help in the gospel. Tom always opened the door every Lord’s Day morning at the Black Earth Gospel Hall, greeting all with a genuine smile and warm handshake, and often with a hug when leaving. He and his wife, Juanita, faithfully held children’s meetings in their home for more than 20 years. With a love for sinners and for the gospel, because he loved His Lord, he often emphasized, “It’s the blood, the precious blood.” Tom’s funeral was attended by many, and as he would have it, the gospel was told forth by his close friends, Jerry Jennings and Mike Wenger, with Joel Portman giving comfort from the Word as well. Tom is survived by his loving wife, Juanita, their seven children, as well many extended family whom he loved. Lois Vanstone of Portage la Prairie, MB, on November 1, 2016, age 98. Raised on a remote farm in Saskatchewan, the family often spent Sunday evenings listening to the gospel preaching of Charles E. Fuller on the radio. As a girl, during one cold winter evening, she embraced the warmth of Christ’s invitation for forgiveness. As a teenager, she moved to Winnipeg for work and eventually married Ed Vanstone of Portage. They lived the next 66 years in happy fellowship with the believers in Portage until Ed was called home in March 2011. After Ed’s passing, her own health declined, yet she retained a keen interest in ongoing gospel works, especially that of Seed Sowers and those of her son Ross. Lois was given to hospitality and opened her home to neighbors, the assembly, and many friends visiting from far and near. A large funeral was held in the River Road Gospel Hall where the gospel was preached and fitting tributes were given to God’s grace experienced during her long lifetime. She is survived by her sons David and Ross, her daughter Hazel Dyck, and daughter-in-law Cathy Vanstone, and their families. Alan Ritchie of Brandon, MB, on November 6, 2016, age 89. Alan was saved March 24, 1946. There was an immediate change in the life of an 18-year-old who was just getting into the world, far away from God. That Sunday night, he listened to the preaching of two respected assembly elders. George Keeling spoke on 1 Timothy 1:15, and Sam Vanstone spoke on Romans 10:9. Alan saw himself as a lost sinner in the first message, and in the second message he trusted Christ. He told his unsaved friends of his new-found faith in Christ, but they wanted none of it. Alan is survived by his loving wife, Beatrice, who was a true helpmeet to him, three children, Marilyn, Douglas, and Philip, along with their spouses, grandchildren, and great-grandchildren, a sister, Lenore Parker (Winnipeg), and a brother, Earl Ritchie (Vancouver). Dorothy Mildred Wood of Swan River, MB, on November 28, 2016, age 92. She was saved in 1952 after attending gospel meetings conducted by Mr. Scott. She was in happy fellowship in the Swan River/Minitonas assembly and spent the last several years with her family attending the assembly at Grande Prairie, AB. She had a good testimony in the community, loved the youth, and was a faithful Sunday school teacher for many years. She will be missed by her seven children and extended family and circle of friends. The funeral was taken by James Ronald. Arnold Studnicka of Blue River, WI, on December 9, 2016, age 74, went to be with his Lord about nine hours after a tragic car accident. He was born again April 13, 1970, having heard the gospel all his life. He faithfully attended the Blue River assembly, loved the Lord, and appreciated the gospel and those who preached it. It is the prayers of the Lord’s people that one older brother of four siblings will yet be spoken to and saved as the result of Arnold’s sudden home-call. The large funeral was conducted by Eric McCullough and Jim Frazier. Betty Tenorio of New Lenox, IL, on December 11, 2016, age 77. She was born in Columbia, S. America in 1938 and was introduced to the gospel through her then future husband, Osvaldo, while both lived in Medellin, Columbia. Betty received the truth of Matthew 11:28 while attending a conference in the spring of 1967. She came to the US in 1969, followed by Osvaldo in 1970, where they were married in June 1970 in Chicago. They began gathering with the believers in Joliet/New Lenox in the late 1970’s and faithfully attended the meetings with their two young girls even though they had to travel a long distance. Betty was a no-nonsense, detail-oriented sister with a strong devotion to her faith and family. She loved reading and cooking for others. After being diagnosed with Alzheimer’s in 2009, she slowly lost her ability to serve and ultimately to communicate. She was faithfully and lovingly cared for at home by her husband and family until her home-call. She was predeceased by an infant daughter, Sarai, in 1973. She is survived by her husband, Osvaldo, two daughters, Brenda Hodgson and Naomi Gilbert and their families, and three unsaved sisters in Columbia. Larry Perkins shared the gospel at the funeral. Kerwin Brandt spoke at the graveside. Lauren Ruth Coleman of Jamison, PA, on December 15, 2016, age 19. She was born on May 22, 1997 with cystic fibrosis. While it was a long and trying experience, it did not define her. Lovingly cared for by her mother, father, and two brothers, she faced each day with a happy countenance and with courage. Lauren trusted Christ through the words of John 3:16 while attending gospel tent meetings on June 9, 2010 being conducted by Murray McCandless and John Meekin. She was in fellowship with the believers who gather to the Name of the Lord Jesus Christ at Hatboro, PA and faithfully attended the meetings as her health allowed. She was known for her beautiful smile and a meek and quiet spirit. Hundreds of friends attended her memorial service where a family member read recollections of Lauren’s life, written by her parents. Gene Higgins faithfully preached the gospel as he told how Lauren was saved. Mention was made of her personal Bible and the numerous Scriptures that she had highlighted, showing her confidence in God and contentment with His will. Gene Higgins and Jon Procopio took part at the graveside. Continued prayer for the family would be appreciated. Robert “Bob” Wylie of Windsor, ON, on December 17, 2016, age 84. He was born in Belfast, N. Ireland on July 12, 1932 and born again in England as a young man of 20. Bob and his wife Betty (2002) lived most of their married years in Windsor and were marked by faithfulness to the local assembly, with a home that was open to the Lord’s people. He was a kind and steady man with a good sense of humor and a flair for writing poetry. Bob was a dedicated overseer and shepherd of God’s people. The number attending the funeral attested to his being “a brother beloved.” The service at the funeral home was taken by R. Fairley and A. Dryburgh, with A. Coenraad and M. Younan at the graveside. Bob will be deeply missed by all who knew him and especially by his daughter, Mary Ruth (Scott) McAlpine of London, ON, and son David (Melanie) Wylie of Windsor, as well as his five grandsons. Editorial: Are We Preaching Good News?